Beverly McIver has been awarded the Rome Prize. Also in the news, her HBO documentary Raising Renee is now available to stream on Amazon Prime. For over a century, the AMERICAN ACADEMY IN ROME has awarded the Rome Prize to support innovative and cross-disciplinary work in the arts and humanities. Rome Prize Fellowships include a stipend, room and board, and individual work space at AAR’s eleven-acre campus in Rome. 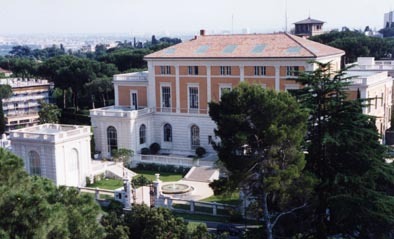 The American Academy in Rome’s main building contains most of the studios, studies and residences of the Rome Prize winners, the library, dining facilities and administrative offices, as well as exhibition galleries, communal spaces, a dark room and archaeology facilities. The Academy has extensive gardens and additional buildings. Read about the history of the American Academy in Rome here.